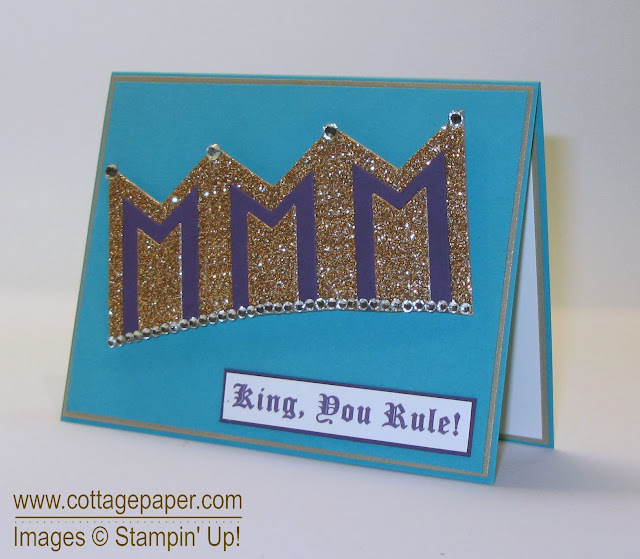 Cottage Paper: A Royal Birthday! Today is a special day and to celebrate this special day, three of us are participating in a blog hop. What's so special about today you ask? Well, it's Brian King's birthday! Brian is our Stampin' Up! upline and "King" of our "InKing Royalty Team". We hope that you enjoy our little blog hop dedicated to Brian as he celebrates his special day. I'm number 2 in the list; the full blog line-up with links to all of our blogs is listed at the bottom of this post. I hope you'll click on each link to see the special cards that we've made for Brian. And, when you're done, you may want to check out Brian's blog. He always has something amusing to share with his readers. When I started to think about a card for Brian I immediately thought it should have a royal theme. I thought a crown would be a good choice. Stampin' Up had a great stamp set called You Rule! that contained a crown. Though the set is retired it is still available as a digital download but Brian had made a fantastic card with that set and I knew I couldn't improve on it. Then I thought about possibly creating a crown with punch art. After looking at my punches I didn't see anything that I thought would work but then I thought of the Banners Framelits Dies that are available from the new Celebrate the Everyday catalog which begins January 4. Demonstrators can order from this catalog early and I had ordered this Framelits set. It seemed perfect! I could cut three sets of three different sized banners and layer them to create a crown. I originally planned to use the Brushed Gold cardstock throughout but then I remembered the Champagne Glimmer Paper (FYI it is cardstock weight even though it is called "paper") and it seemed perfect for the crown. Brian is not a fan of glitter but I think Glimmer Paper on occasion meets with his approval. When I think of royalty I think of deep purple so I pulled out some Elegant Eggplant to use with the Glimmer Paper. I had planned to use the You Rule sentiment stamp in MDS from the set mentioned above and also use another stamp from that set and in MDS create the sentiment "King, You Rule". As I was working in MDS I realized I could just use a font in MDS to create the sentiment! I also used the font to print "Happy Birthday" on the inside of the card. Here is my card. 4. Brian King at Stamp with Brian -- Don't forget to leave him a comment to wish him a happy birthday. Thank you, Katie! This is such a cool card! I love the ingenuity you put into it and think the banner framelits are perfect here. What a wonderful surprise this morning. I'm so fortunate to work with y'all. Thanks! Oh my gosh!! What a gorgeous card... and a fantastic play on Brian's name. What fun! Very cool card. I follow Brian everyday, now I will be able to add ya'll to my fav's have a good day. Katie!!! Your card is perfect! What a incredible gift for Brian....A blog hop just for him! Wow, that card is perfect! Love the way you created that crown. So clever. What a great way to meet three new bloggers. This was a great idea for you three to do for Brian. :) I love the use of the banner punch. Definitely a CASE . . . thinking of a 6 year old girl. I think I forgot to tell Kelly I liked her card too. Thank you Nance! I actually made the card with the Banner Framelits not the Banner punch but the punch would work too. Your crown would just be smaller and it wouldn't have layers but you could use a lot of great embellishment!! He DOES rule and so does your clever crown card, Katie! Wow! You really thought outside the box with AWESOME results.... Brian is the King!!! So cute and very proper for His Highness ! You came up with a great card . I know he loves it ! Love the banner crown, so creative!!! Totally like all the 'bling'. Definitely fit for our KING. Using the glimmer paper is perfect for the royal celebration today. Nice job. Great card! I think the glimmer paper is just great and I'm sure even if it had a little "glitter" Brian wouldn't mind. Not when he gets all this attention on his birthday! Thanks for sharing your creation..... I will continue to follow you too! Thank you all so much for taking the time to comment!! I am glad you like my card. We three had a lot of fun creating our posts and surprising Brian! I think we do all feel that he is our King.